Panavia Tornado, jointly produced by the then British Aerospace, MBB, Aeritalia. Almost 1000 built. The MRCA (Multi-Role Combat Aircraft), as it was known for many years before it was named Tornado, took many forms as described below before its final shape was decided. The UK design team worked at Warton near Preston. Manufacture took place at the Strand Road factory in Preston and Samlesbury, with major assembly and Final Assembly and flight testing also at Warton. The Tornado was put together at Warton from parts delivered from Samlesbury and Preston and overseas in accordance with the workshare between the 3 participating nations. Front and rear fuselages were delivered from the Preston sites factories to Germany and Italy. Centre Fuselage and Wings came from Germany and Italy direct to Warton. The engines were delivered from Rolls Royce who had their own consortium exchanging parts. 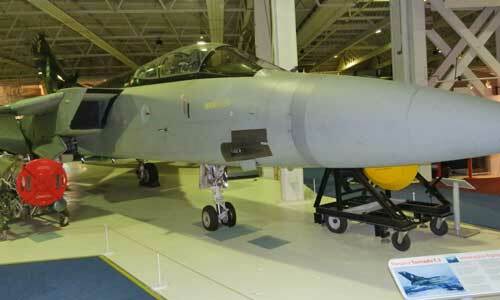 Tornados for the RAF and some export customers were flown and delivered from Warton. 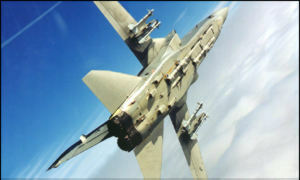 The Tornado had very sophisticated equipment on board enabling low level flight using a terrain following radar. . At the time of initial delivery the Main Computer had less memory than a current day calculator yet it managed to enable high speed flight just above ground level, at night, while carrying any one of many weapons to a target with pin-point accuracy. Each participating nation had a fair proportion of work with major equipments having parts made in different countries. The Tornado programme, its multi-national management, industrial worksharing, coupled with cutting edge technology, could have been one of those famous large project disasters. Yet it worked very well. Each company and government departments from all over Europe working together without scandal or hostility. All of this came together near Preston several hundred times and was delivered to our customer, the RAF, by air with great pride. Started in the late 60's as the Anglo-French Variable Geometry aircraft. The French dropped out in the late 60's. The British, Germans, Italians, Dutch, Belgian and Canadian governments discussed their requirements. It became the Panavia Multi-Role Combat Aircraft (MRCA). Go-ahead 1969. The Dutch, Belgian and Canadians dropped out by early 1970 and the aircraft design stabilised towards the two seater. Several versions were built including the basic ground attack version, the UK air defence version, the German Electronic Combat and Recconaisance version. The UK have updated their ground attack aircraft to the GR4. The organisations that delivered this project were the 3 nation government agency - NAMMA (NATO) MRCA Management Agency based in Munich. The airframe consortium company; Panavia, based in Munich, formed by British Aircraft Corporation, MBB, Fiat. (becoming BAE SYSTEMS, EADS-DASA, Alenia and then BAE Systems, Airbus Defence, Leonardo). The engine consortium company; Turbo Union, formed by Rolls Royce, MTU, Fiat. Avionic consortium company; Avionica, formed by EASAMS, ESG and SIA. This was soon dis-banded and Panavia became responsible. The GR4 is the result of a British Aerospace upgrade programme to GR1 aircraft, adding Forward-Looking Infra-Red (FLIR), a wide angle Head-Up Display (HUD), improved cockpit displays, Night-Vision Goggle (NVG) compatibility, new avionics and weapons systems, updated computer software and Global Positioning System (GPS). The upgrade also allows for carriage of the Storm Shadow stand-off missile, Brimstone advanced anti-armour weapon, RAPTOR and Vicon reconnaissance pods and the Thermal Imaging Airborne Laser Designator (TIALD) targeting pod. A separate programme covered an integrated Defensive Aids Suite consisting of the radar warning receiver, Sky Shadow radar jamming pod and BOZ-107 chaff and flare dispenser. The heart of the Tornado GR4's navigation and attack system is the main computer, which takes its primary reference from an inertial navigation system (INS) supplemented by Global Positioning System (GPS). Targeting inputs can come from the GMR, FLIR, TIALD, Laser Ranger and Marked Target Seeker (LRMTS) or visually, and available weaponry includes Paveway 2 or 3 laser- or GPS-guided bombs, ballistic or retarded "dumb" 1000lb bombs, Cluster Bomb Units (CBU), Storm Shadow, Brimstone, Air Launched Anti-Radiation Missile (ALARM) and Sidewinder missiles and a single 27mm cannon. The Tornado GR4 will be retired from RAF service on 31st March 2019, brought forward from 2025 as part of defence cuts. The German and Italian Air Force Tornados are expected to continue to 2025. The ADV was the UK main fighter aircraft, replacing the Lightning and Phantom, and 165 including 3 prototypes were ordered. The aircraft was based on the IDS version but with a fuselage extension for extra fuel and with a longer radome for the radar which like the avionics and weapons was tailored for the air combat role. This included the Foxhunter radar which was made by the then Marconi of Edinburgh. Also the Skyflash missile made by BAe Stevenage from the AIM7. The aircraft has had several updates and was bought by Saudi Arabia and loaned by the Italian Air Force. The ADV has been in service since 1984, over 20 years, and will be replaced by the Typhoon. It was retired from RAF operational service on 22nd March 2011. In 1993 a combat simulator 'game' was produced (not in Preston) which at the time was one of the most complex home computer simulations available. Some said it was too complex but I found that it had great depth. It enabled a mission to be produced using the Ground Mission Planner with selection of weapons, waypoints, targets, speed, altitude etc. The mission could then be flown from the cockpit with a realistic front and rear display with TV?Tabs, radar modes, ECM, autopilot modes, all working and with flak and enemy planes in chase. 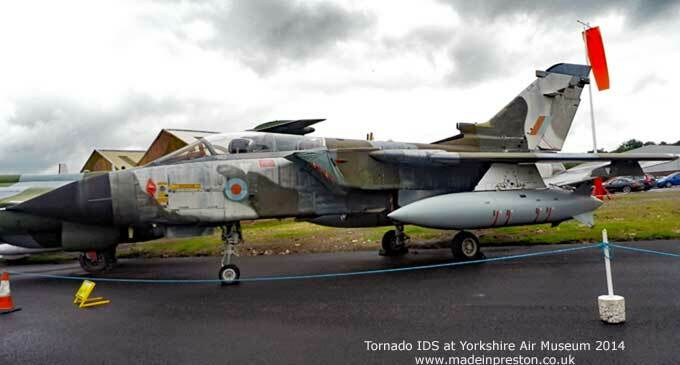 A great feature which the Tornado may have been capable of was to perform a long mission in darkness, at low level, 'handsfree' except for take-off, landing and countermeasures. Alarm was a good missile to have, fire those and watch the enemy radars disappear. Loft bombing was quite neat as well to get targets from over a hill. Can't say I had much luck in that though. Laser designating I could see why there is 2 crew although I guess training would help. ADV?sorties could also be planned, the Combat Air Patrol usually involves flying round in circles until an enemy appears. Best to fire a few long range missiles and run, I never had a lot of success and wouldn't have made much of a pilot. First there's a bang and flash and maybe just some instruments go off with visual and audio warnings, then things deteriorate and there's a lot of vibration. Finally the aircraft sinks to the ground and the game ends. A bit annoying if you've been flying for 30 minutes. The game is still available second hand on auction sites and the DOS version can work with a utility called DOSbox. After flying the home computer version it increases your admiration for the people who do actually fly them. All that training, putting on the kit, planning the mission, climbing in and all that power and danger putting you under pressure. The Tornado was designed to fly beneath the Iron Curtain fast and low, leave its mark and return to do it again. On a dark winter night with no moon, perhaps raining or with snow about you'd take off in what is quite a large and very complex vehicle and head into what would have been massive defences with plenty of unknowns. What if your electronics gets swamped by counter measures and your bomber isn't going to fight a fighter very well even with its Sidewinders. You need your terrain following radar but its giving you away and so would your own ECM and once you're in they know you are there and you have to get to the target and back. Things weren't as advanced then but all things being equal it's always a matter of judgement about whether your solution will meet a requirement that you can't be sure of. The other side of that is to enjoy seeing them flying over the lake district.